Our Solid Carbide Burs are available in money-saving sets. All are packaged in sturdy hardwood boxes. Available in Plain or Double Cut (except for 1/4" shank set which is plain cut only). Set A. 3/32" Shank, 1-1/4" Overall Length includes 1 each of 9 carbide burs, 1 piece construction. Plain or Double Cut. Set B. 1/8" Shank, 1-1/2" Overall Length includes 1 each of 12 solid carbide burs, 1 piece construction. Plain or Double Cut. Set C. 1/8" Shank, 1-1/2" Overall Length includes 1 each of 12 solid carbide burs, 1 piece construction. Plain or Double Cut. 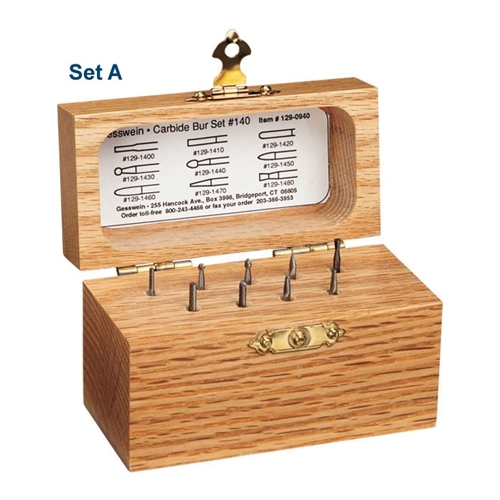 Set D. 1/8" Shank, 1-1/2" Overall Length includes 1 each of these 9 carbide burs. Carbide heads with 1/4" cutting diameter securely brazed on heat-treated shanks. Set F. 1/4" Shank, 2" Overall Length includes 1 each of 12 solid carbide burs, 1 piece construction. Available in Plain Cut only.